UNTREATED, totally natural, Sapphire from Columbia, cut in one of original OMNI Oval designs. This gem has fascinating character. It's eye clean, but under high magnification, it shows a sprinkling of included crystals. I spent hours with this gem under a microscope! Sapphire from Africa, cut in one of my custom OMNI designs. A fiery-red 0.33 carat Pyrope Garnet in the 6-Petal flower design by artist John Bailey installed in grey Basalt along with a tiny Pink Sapphire from Africa. This uncooked natural Sapphire from Nigeria is cut in a standard round brilliant design. 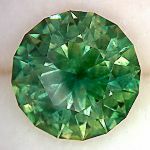 Typical of much uncooked Sapphire, it shows significant green overtones and flashes, depending upon lighting. Untreated material is ever more difficult to find - especially in pieces this large and clean. A really fine natural Purple Sapphire from Africa. 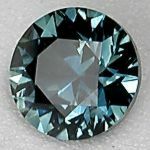 Dark blue Trust Certified Australian Sapphire in a fancy checker crown reflector cut. This little African Sapphire is so juicy that in some light it will be mistaken for a Ruby! African Sapphire cut in an unusual "twisted triangle" design. 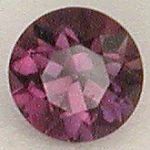 Natural, untreated Sapphire from Africa (Tanzania) in a juicy purple color. Natural blue Sapphire from Africa - unstacked SRB showing off scintillation. Natural blue Sapphire from Africa in a nice unstacked SRB that increases scintillation. This uncooked natural Sapphire from Nigeria in a standard Trilliant design shows velvety-blue color throughout - which is very difficult to find in untreated material! Very pretty natural blue Sapphire from Africa cut in an unstacked SRB to show-off scintillation. 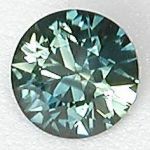 Nice little African Sapphire with great medium-light cornflower blue color. Natural, untreated blue-green Sapphire mined by my friends in Australia. Nice little African Sapphire with a slightly greenish velvety cornflower blue color. This stone has a single small flaw not visible without scrutiny. 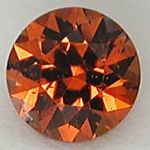 This natural, untreated Australian Sapphire is cut in a fancy apex crown design. It is cut across the optic axis so it flashes both midnight blue and dark green in an almost cat-eye-like pattern.